Whatever you remember it as — a superstorm, a hurricane, Frankenstorm — Sandy was a real witch who changed the lives of millions in the Northeast. While the initial impact was clear, causing families to live without power, water and more, what effect is it having in the long run? And how did it change these families? When Hurricane Sandy roared toward the East Coast, Emily Rozek and her husband weren’t expecting much — after all, it was a category one hurricane, which means it wasn’t that strong. “We were completely blindsided by the impact of this storm and are still shocked that something of this magnitude reached us here in the Northeast. I grew up in upstate New York and have never experienced anything like it,” says Rozek, who says her Florida-native husband wasn’t expecting much either. Fortunately, Rozek and her husband prepared anyway at the insistence of friends. “We could not have been more wrong in thinking that the media was hyping up the impending storm. It remains to be one of the most terrifying 24 hours we have lived through,” says Rozek. Rozek’s family lives in New Jersey, in a hard-hit area. After a night of loud winds and falling trees all around them, they were without power for nine days — then lost it again for four days after a nor’easter hit the area. 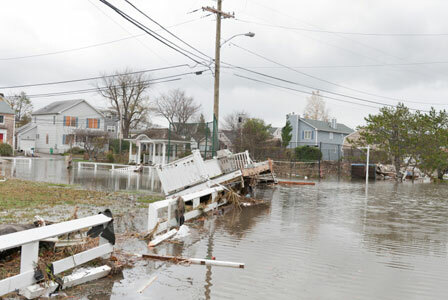 Rozek and other families in New Jersey, New York and Connecticut are still recovering from Sandy. Some will be recovering for a long time to come as they rebuild their homes and lives. But the storm has already changed families. For Cate O’Malley, a single mother from New Jersey who was without power for eight days, she and her kids were left with a greater appreciation of what they have. “It really drove home the importance of appreciating the little things (a hot meal at a friends’ house) and the not so little things (our beds? ),” says O’Malley. All over the Northeast, people — neighbors, friends, family — came together, helping one another. Amid the destruction, kindness and community shined through. If there is one thing that Sandy taught many parents, it’s that there is great value in being prepared. For mother Nancy W. Berk, Ph.D., author of College Bound and Gagged, the approach of Sandy left her hustling to help her son evacuate from lower Manhattan, where he is a student at New York University. “I believe the situation made us all realize that preparation and procrastination don’t mix. You need to have the basics before people start panicking. College students should always have flashlights, batteries, refills of their prescription medication, long before the storm hits,” says Berk. Another item of importance? Ensure “that students have contact information for friends, relatives, and contacts near the city they are living in and beyond. And parents and students should have contact info for roommates/friends and their parents — especially since a phone tree can save battery power and anxiety,” says Berk.